I have my doodlebug with a '22 engine I am trying to start for the first time. It has previously ran with someone elses carb, so I know the engine itself runs. What happens is that when I get it to fire up, gas starts pouring from the carb, I am not sure why this is happening though. Then, as soon as the engine stalls--presumably due to being rich, the gas will continue to drip, drip, drip until it stops. When the gas stops dripping, I try to fire the engine again, and the same thing happens. What can I look for here? The leading suspect would be a leaking float valve. 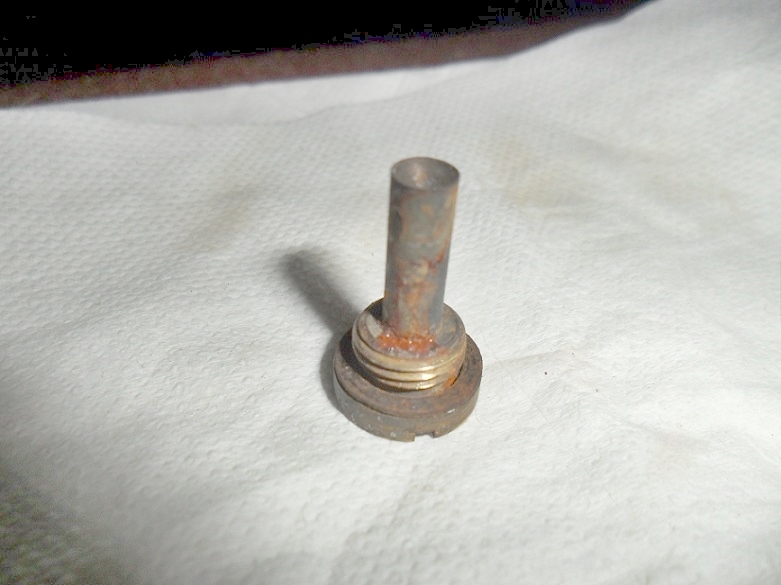 Reasons might be a bit of debris in the valve, no gasket under the seat, damaged needle tip, or leaking float. OK, I buy that Steve, but why would it not continue to leak by just turning the gas on? If I get what your saying essentially the float valve is staying open--right? I will pull it off and have a look. This is a rebuilt carb I bought from someone, hopefully it is just debris in it and they didn't leave out or have faulty parts. I think I may have found the issue. I had another NH parts carb that was all apart already. It looks as if I am missing this piece in the picture below. I believe this is the seat for the mixture needle to seat against--this is out of my parts carb. If so that is a huge piece to be missing out of the rebuilt carb, and explains why I had so much fuel. I didn't see any other debris in the carb otherwise. Steve, thanks for your help. I contacted the person who rebuilt it and he is taking care of it. The needle is new along with other parts, it was just an over site that it got left out. S&!t happens sometimes. I actually cleaned up the old one from the parts carb and installed it and it fired up, but ran crappy. Of course I should have cleaned the plugs because they were trashed, no response from any mixture setting, blowing black soot out, etc. So they are clean now, hopefully all will be well when I try again tomorrow. But the fact it fired up and ran was a good sign. Even with a new spray nozzle, it might not run well. If the brass plugs weren't removed to clean the internal passages it may be plugged and not run correctly. Once you drill them out and clean them, you can either use 1/2 brass rod to plug them again or tap them and plug them with Allen head set screws. Try 1/8 inch brass rod,it will fit easier... LOL. Yes Gary, he cleaned the passages and put in the small allen head screws. I managed to get it fired up and with the cleaned plugs and it ran much better. Just trying to dial it all in now.